Our early childhood music teacher program is expertly planned, executed, and supported. We are a trailblazer of early childhood music education in the United States - As part of the author-team for a German national preschool music curriculum, Musikgarten founder Dr. Lorna Heyge was commissioned in 1974 to test and write the North American adaptation. The result of Dr. Heyge's work was one of the first childhood music programs in the USA, and over forty years later, its basic principles are still imitated in early childhood music curricula across the country. Audrey Sillick trained early childhood educators for 40 years. Comprehensive Pedagogy - The Musikgarten program is the most pedagogically sound program available, covering children from birth to age nine - a complete bridge from early childhood to teaching piano lessons. Our children's music curricula are uniquely effective because we have designed learning sequences that repeat and build patterns to continually reinforce and stimulate our students. Students will enjoy their lessons more and you will be able to retain them for up to nine years. This continuity is as valuable to you as it is to the child. Follow Your Passion, while Balancing Family and Career - If you love music, children, or teaching, Musikgarten is your opportunity to command your own career. We offer the training you need to be successful at running your own business, but also provide the flexibility to balance your life. Starting a Musikgarten Studio doesn't "Break the Bank" We understand that small businesses don't have a lot to invest right away. Compared to other childhood music programs out there, Musikgarten offers lower start up costs, because we want our partnership to grow as your business grows. It's Your Studio. You Call the Shots. 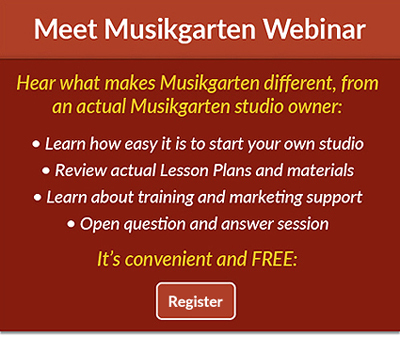 - Musikgarten wants to be your partner, not your boss. While we support your studio with student leads and excellent business tools, our flexible program enables you to make the decisions that affect how your business is run. Our children's music lesson plans and other resources can be used as a guide to your own creative studio or classroom teaching. Lesson planning cards make it easy to mix and match the songs and activities to your students and setting. Unlike other programs out there, Musikgarten doesn't require you to share your student lists. Real Training and Support from Real, Successful Mentors - Whether its Small Business Marketing training, or Curriculum training, our experienced mentors have proven track records of success. Most of our music teacher trainers have had their own successful studios for over a decade. Because of the quality of our teacher training, parents and children will recognize you for the high quality of your classes. Musikgarten resources reflect the latest research in early childhood development and combine the talents of top authors, musicians, and artists to bring a complete and holistic approach to teaching children music. Our Business Advantage Program (BAP), including telephone and on-line support, is always available to you and continually improving. For more reasons why people around the world make Musikgarten their choice for early childhood music lessons, contact us today.